Originally published under the title, "Four Steps India Should Take to Counter Pakistan-Sponsored Jihadi Terrorism." 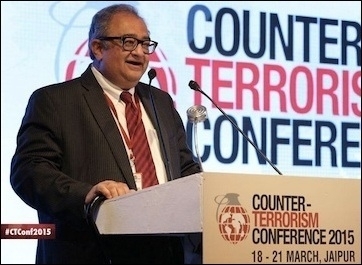 Fatah addresses the Jaipur Counter-Terror Conference hosted by India Foundation, Mar 18-21, 2015. Seventy years ago today, the Red Army was knocking on the doors of Berlin, and on May 5, 1945 it captured the German capital to bring to an end to the five year war in Europe. In those five years, the USSR and its western allies, including tens of thousands of troops from our India, destroyed the largest army ever mobilised. When the guns went silent, 50 million men and women were dead, including six million in the death camps, where Hitler tried to exterminate the Jewish people. We were able to destroy the might of the German Wehrmacht in a mere five years, yet today, 14 years after the United States declared a war on terrorism, we have not only failed in defeating the forces of international jihadi terrorism, we have ended up strengthening the very enemy we sought out to destroy. The United States alone has spent 5.1 Trillion dollars on this war. For every dollar the Jihadi terrorists spend, the USA has to match that dollar with $75,000 dollars. In addition, over a million men and women have died in conflicts around the world instigated by Islamist jihadis. Instead of draining the terrorist swamp, we are shooting down one mosquito at a time. The question to be asked is: why such a spectacular failure? Let me put it succinctly. To fight malaria you need to drain the swamps, not kill individual mosquitos. We have left the drains stagnant and sent missiles to shoot down mosquitos. The result has been that for every mosquito killed, a thousand are ready to replace it and spread the disease. Instead of draining the swamps, we are shooting down one mosquito at a time. But to drain the swamp, we need to identify it. The one country, the elephant in the room that no one wishes to speak about is the original "Islamic State of Pakistan," the mother lode of international terrorism, yet the beneficiary of billions of dollars of American largesse. The question is, what can India do to counter Pakistan aggression and to stop jihadi terrorism from infecting its own Muslim population, which has so far been immune to the attraction of the Islamic State and Al-Qaeda? Disengage with Pakistan completely. No talks, no visits, no trade. Since Pakistan itches for parity with India, Delhi should shut down the silly 'March of the Roosters' at the Wagah border. This act is the single most spectacular circus that puts the rogue state of Pakistan at par with the democratic, secular and dignified Republic of India. End the ridiculous 'Aman ki Aasha' that is nothing but an embarrassing exercise by Pakistan's upper class Hindu-hating, pan-Islamist orphans of Jinnah who benefit enormously. An entire industry has been created that is milking Indian goodwill to do the Pakistan military-civilian establishment's bidding and propaganda. Finally, India should not wait for a second Mumbai to create an independent Balochistan. Delhi should start assisting the brave men and women of Balochistan today. It should help the young fighters of Dr. Allah Nazar in the hills and Baloch exiles like Mehran Marri and Brahamdagh Bugti. India should plan and work towards the policy goal — unwritten and unsaid — for the disintegration of the so-called rump state that refers to itself the Islamic Republic of Pakistan. I say so-called state, not only because there is nothing 'Paak' about Pakistan, but because Pakistan in 1971 effectively changed its name to Bangladesh. What we call Pakistan today is Pakistan's leftovers.